I am Rajesh Kumar from Pune, India. My child is suffering from a very rare disease called Short Bowel Syndrome(SBS) because of doctor's negligence and delayed surgery of blockage in small intestine. The problem which would have been treated easily is now life threatening and too expensive to afford. He is not able to digest food and get proper nutrition for his growth. Small bowel transplant is essential for his survival. 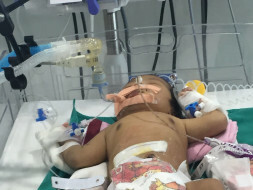 He is currently in PICU from 2.5 months on TPN( total parental nutrition and approximately 4 lacs a month hospital expense) and would be needing small intestine transplant in few months of time that will cost additional 25-30 lacs. His treatment is continued in Ruby Hall Clinic Pune. Appreciate any financial assistance to continue my child treatment.